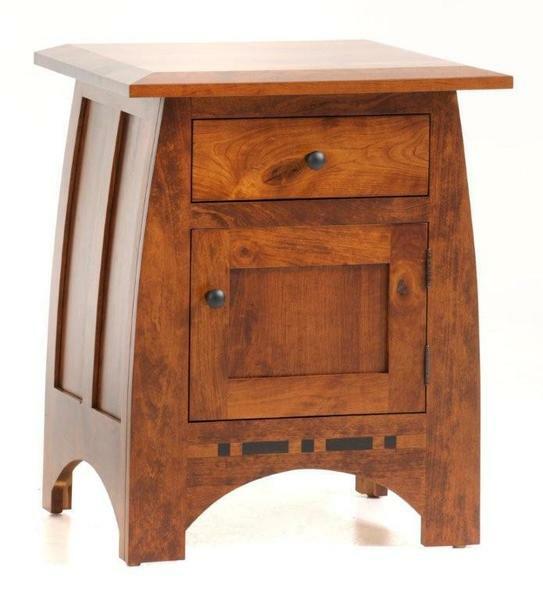 From the beautiful beveled edge of the solid hardwood top, to the subtle arches of the case, the Amish Vineyard Night Stand is a stunning example of modern flair with a classic Mission influence. With a full-extension dovetailed drawer and a cabinet underneath, you'll be sure to have room for all of your bedside necessities, right where you need them. Each piece in our Vineyard Bedroom Collection is bench-built by skilled Amish woodworkers in Ohio and is crafted from the finest, hand-selected hardwoods that North America has to offer. With the option to selected the perfect wood and stain combination, your new Vineyard Nightstand will be the perfect bedside counterpart to compliment your unique decor! And, with the addition of the soft-close slides, you never have to worry about slamming your drawer and waking your partner again! Learn more about the woodshop here. Shown here in Rustic Cherry with a beautiful Michael's Cherry Finish, the depth and natural beauty in every grain is carefully displayed. Choose from Cherry or Rustic Cherry for the perfect look on this classic Mission set!